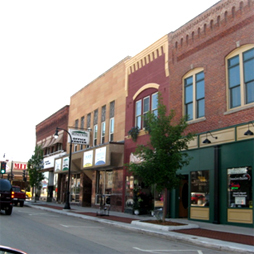 Marshfield zoning code and map | Vandewalle & Associates, Inc.
An excellent example of a hybrid zoning ordinance, the City of Marshfield ordinance implements local plans and helps the community achieve redevelopment and sustainability objectives. It includes a unique Campus Development District, several other mixed-used zoning districts, numerous graphics to illustrate regulations, and a detailed description of all zoning procedures. With a population of 19,000, public involvement, including pen houses, workshops, interviews, focus groups, steering committee meetings, and public hearings, was an important component of the process.